I could tell you that you must read this book because it is one of the landmarks of Israeli literature and a merciless critique of motherhood, nationhood, and postmodern life. 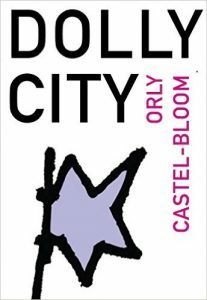 I could also say that you must read it because Castel-Bloom’s style is brilliant, eclectic, vulgar, and lyrical, sometimes all within a single page. But then again, I could tell you that if you have even a remotely sensitive stomach, or reading about violence against children traumatizes you, I must tell you to approach this book with extreme caution. But I’m getting ahead of myself. Dolly City is astonishing precisely because it resists attempts to define its “meaning.” We can speculate all day about why Doctor Dolly carves a map of the state of Israel on her adopted son’s back (and what it means), or why the city is filled with suicides and car crashes and general violence. And yet this resistance is also what opens up Dolly City to a multitude of interpretations. It’s a novel that revels in its own multiplicity. As Dolly herself muses a quarter of the way through the novel, “These symptoms of my disease, the disease of infinite possibilities, the determination of doubt, would even manifest themselves in relation to the very existence of my child” (51). It is this child, whom she names “Son,” who falls prey to her incessant, obsessive operations and medications in her crazed attempt to protect him against any and all diseases or accidents. Dolly is the personification of that saying “when you’re a hammer, everything looks like a nail.” She sees cancerous growths everywhere: on people, on streetlamps, on cars; and she tries to slice these growths off with a knife, paying no attention to who she kills or what she destroys in the process. Dolly City is itself a deteriorating cesspool of violence, lust, and disease, and Doctor Dolly sees it as her mission to, first, protect her son, and second, cure everyone and everything. During her more lucid moments, Dolly understands that she has a serious problem, but ultimately cannot control her almost debilitating anxiety and hysterical drive to count her son’s organs or make sure that a freckle isn’t a cancerous tumor. But Dolly City is about more than just a violent, obsessive woman whose medical credentials are questionable at best. It is, on a larger scale, about Israel and nationhood and memory. The State of Israel that was born in 1948 was shaped in a major way by the Holocaust and memories of persecution and terror. In Castel-Bloom’s novel, the Israeli mandate that every secular Jew (man or woman) must serve in the army when they turn 18 is satirically referenced in Dolly’s son joining the Academy for Brutal Seamanship. Dolly’s hyper-protectiveness is a fun-house mirror distortion of the “Yiddishe mama” stereotype (constantly worrying, fearing the worst, overprotective, etc.). She kills several German babies to secure an extra kidney for her son (thinking that he only has one), and she justifies this act by pointing to German atrocities during World War II. The novel as a whole is a series of distorted scenes where love, motherhood, community, and morality are twisted into almost unrecognizable shapes, in order to make us see them anew. Dolly City is meant to disturb, and it succeeds.